Toba Batak Traditional House called the Rumah Bolon or Bolon House , rectangular and sometimes inhabited by 5 to 6 families. To enter the house need to climb stairs located in the middle of the house, with an odd number of rungs. If people want to go home Toba Batak had lowered his head so as not to knock on the transverse beam, this means guests must respect the pawnbroker. Floor of the house occasionally to 1.75 meters above the ground, and the bottom used to corral pig, chicken, and so forth. In the past the entrance door has 2 kinds of leaf, ie leaf door horizontally and vertically, but now leaves the door horizontally not used anymore. The room in a traditional house is an open space without the rooms, although there dwells more than one family, but that does not mean there is no division of space, because in this custom home division of space is limited by their strong traditional. The room in the back right corner called jabu bong, which is occupied by the head of the house or porjabu bong, with a wife and children are still small. This room was formerly considered the most sacred. In the upper left corner to deal with bong called Jabu Jabu Soding cater for girls who are married but do not yet have their own home.On the left front corner is called Jabu Suhat, for the oldest boy who was breeding and beyond is called Slap Plate reserved for guests. When a big family then held a place in between 2 rooms or jabu are attached, so the room increased 2 again and the room is called Jabu Tonga ni-ronga jabu hue. Each family has its own kitchen which is located behind the house, in the form of additional buildings. In between two rows of the room that is in the middle of the house is a neutral area called the lake and serves as a place of deliberation. Other buildings similar to the house is like a house sopo ie originating from the barn to store, then inhabited. The difference with the home are: Sopo two-story, has only one line of the front pillars and under the open space without walls serves to deliberation, accept foreigners and a place to play music. At the front of the house there are customary trappings with geographic lines and spiral motifs and ornaments in the form of milk a woman who called adep-adep. This decoration symbolizes the source of fertility and a symbol of unity of life. Houses of the most decorations called Gorga. Another ornament is called nipahu fern motif, and thorny rattan called mardusi located on the wall above the entrance. At the corners of the house there are densely packed Elephant decoration, patterned face of the beast, have an intention as against disaster. Similarly, animal-patterned decoration lizard, lion's head which is intended to deny the dangers of such external magic. This decoration is a form of engraving then given color, there is also a form of illustration only. Batak Toba traditional house based on its function can be differentiated into a house that used to shelter the family called ruma, and the house used as a storage (barn) is called Sopo. The materials consist of wooden building with large pillars and sturdy.The walls of the board or the side:, the floor is also off the board while the roof of the fibers. 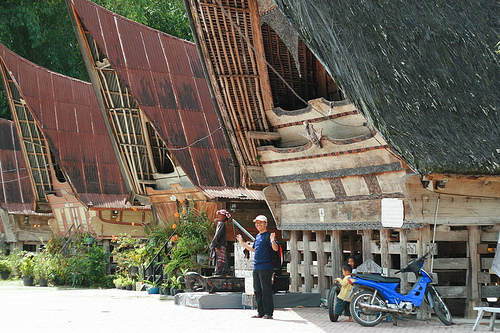 Type the typical Toba Batak traditional houses is a form of a curved roof and the eaves of the front.